It is difficult to imagine that a flowering plant can thrive in hot desert temperatures; but, these vibrant purple sage bushes love the heat! Also known as Texas Ranger Plants, these lavender flowers fill the sage bushes that adorn the streets of the Sonoran Desert. Our Texas Ranger Plants, Leucophyllum frutescens, are blooming with butterflies and bees promenading between the purple flowers. The bees are buzzing noisily as they work their way in and out of the purple blooms. When it comes to drought and heat tolerant plants, Purple Sage is right at the top of the list. The hotter it gets in the desert, the happier this flowering shrub is! 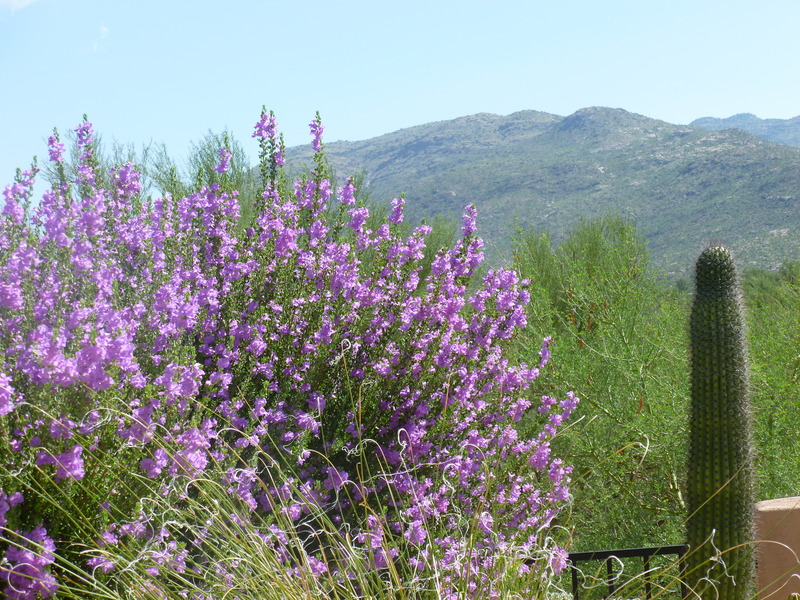 As humidity rises during the start of Arizona’s Monsoon season, the Purple Sage bushes will bloom right before it rains. The purple flowers are a built in barometer! Growing and caring for Purple Sage is easy if you plant them in full sun. This desert bush is native to Mexico and Texas and needs very little maintenance. Texas Sage is incredibly heat resistant and will not be harmed by moderate frost in the winter. The Sage bush variety with white flowers is called White Cloud Texas Sage. It is exactly like the purple sage but with white blooms. The best time to prune your Texas Sage is in the Spring. Over pruning your sage bush will reduce the amount of flowers and cause the plant to use more water. Author tjsgardenPosted on June 28, 2017 June 28, 2017 Format GalleryCategories Desert Plants, Drought Resistant, Drought Tolerant, Flowering Desert Shrub Bush, Flowers, Free Pictures, Hardy Plants, Heat Resistant Plants, Perennials, Purple Texas Sage Bush, Unique Garden Items, White Cloud Texas Sage, Xeriscape, DesertscapeTags arizona flowering shrubs, Arizona Purple Sage, best xeriscape plant, Blooming bush with purple flowers, bushes with butterlies, bushes with purple flowers, caring for sage, desert sage, flowering bush, growing purple sage, perennial purple flowering bush, phoenix bushes, pruning purple sage, pruning texas sage, purple flowering bush in AZ, Purple Flowers, purple flowers shrub, Purple Sage Plants, Sage Bush in California, Sage Bush in Phoenix, Sage Bush in Texas, Sage Bush in Tucson, shrubs with white flowers Tucson Phoenix, texas flowering bush, Texas Purple Sage, Texas Ranger Plant, tucson bushes, white flowering bush6 Comments on Sage bushes with Purple Flowers bring life to the desert!